Above the winter bulbs, and the hellebores, are the flowering shrubs. This being a limey, chalky garden I don’t have any of the witch-hazels that I admire in books. Instead I have viburnum, sarcococca, mahonia, and the odd solitary rose bud in a protected nook against a house wall. This last never looks quite right, or happy, in January, and will never open even if picked and brought inside. The viburnum (viburnum x bodnantense ‘Dawn’) makes me smile every time I look at it. The flowers are not a terribly fetching shade of pink fading to white, but their shape, size, and the way the sit on the bare branches is absolutely perfect. It has the grace, form, and pared down elegance of an exquisite Japanese flower arrangement. I think it smells bad though. This doesn’t stop me bringing small branches into the house, however, it is too attractive. Fortunately the smell is not strong. The sarcocca hookeriana humilis, Christmas box, smells sweet, but it’s still a relatively new arrival, looking a bit spindly whilst it finds it feet, so for now it gets largely forgotten. I hope it does decide to be happy, because it is a plant I like, and would like to have more of if this one takes off. 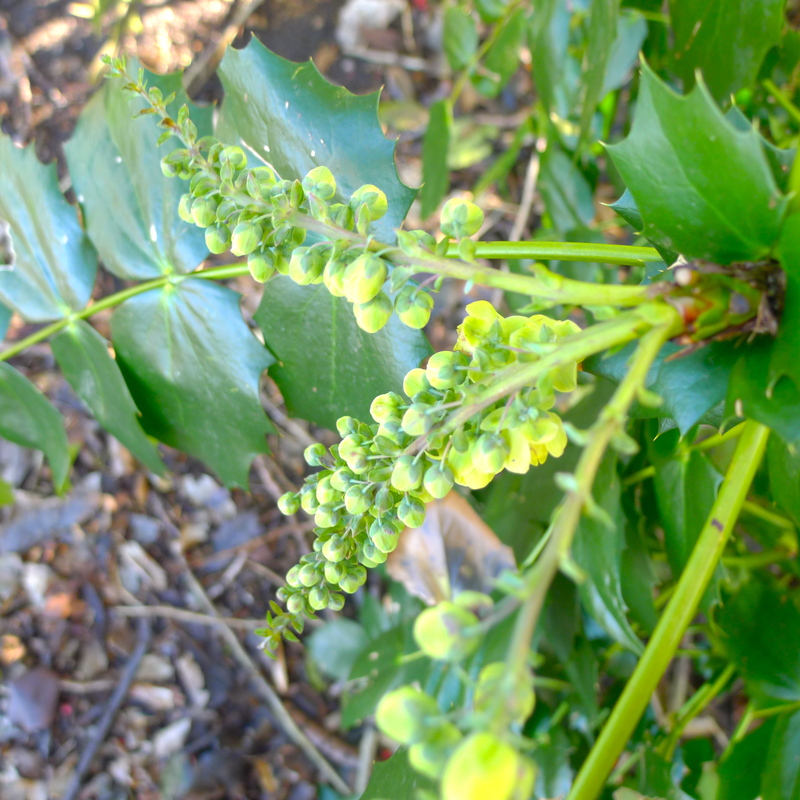 The mahonia japonica on the other hand, could never be forgotten. It is a sprawling monster of a thing, which has layered itself merrily over the years, increasing its circumference significantly. It lounges inelegantly under the unidentified sorbus that keeps it in deep shade for most of the year. It is dark and not terribly interesting to look at most of the time, despite its sharp, pinnate leave. Right now however, its tips are dripping with golden tassels of lily-of-the-valley scented flowers. These charming, strongly scented flowers will keep coming for a couple of months or more. The smell is glorious, and comes out to greet you as you approach the shrub, filling the air around it for several metres. I love it, and visit it every day. Often I will grab an entire cluster of flowers, and with a sharp tug pluck the lot from the plant. 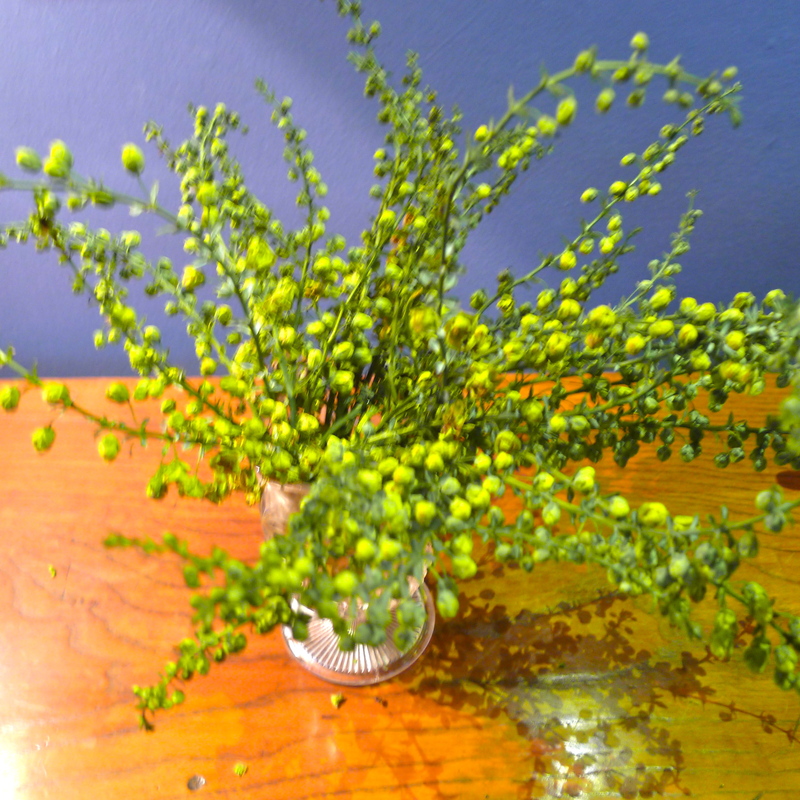 These delicate looking golden sprigs are then put in a little glass, so I can breathe in the scent whilst sitting in the warmth of the house.